The first release of this year was an [update of Android app](https://blog.adguard.com/en/adguard-for-android-new-release-version-2-1-359/), version 2.1. In this post we won't elaborate on changes of every release, instead we will put links to the correspondent posts for those interested. February started with a [browser extension release](https://blog.adguard.com/en/adguard-browser-extension-2-1/). Version 2.1 made it much more lightweight. (Windows version). In 2015 we were bombed with questions on when will the new version be released. It truly marked the fully updated interface, new features and simply a new chapter in history of Adguard for Windows. Next, it was time to release a new version for Adguard for iOS users. By the way it's a rather fresh product in Adguard family (the first release was just in October 2015). In this version we tried to fix all the found bugs. In March we have laid down our global [roadmap](https://blog.adguard.com/en/adguard-roadmap/), which still regulates our workflow. And allow us to 'brag' a little that we have managed to fulfill many of that tasks this year already. By the way, if you are interested in Adguard development, you can always 'track' us, all our tasks and goals are shared [on GitHub](https://github.com/AdguardTeam). Then the new extension version followed. Yeah, it's been just a month since the last release, but this update was especially important because of Firefox changes and some technical additions. In April we have continued to refine version 6.0 of Adguard for Windows which was released in February. We went through the feedback, fixed errors and presented the update, [version 6.0.2240](https://blog.adguard.com/en/adguard-for-windows-update-version-6-0-224/). at Webit Festival Europe. We got a booth, a place where we could tell everyone interested about Adguard. Then we had a presentation in front of the jury. And guess what? 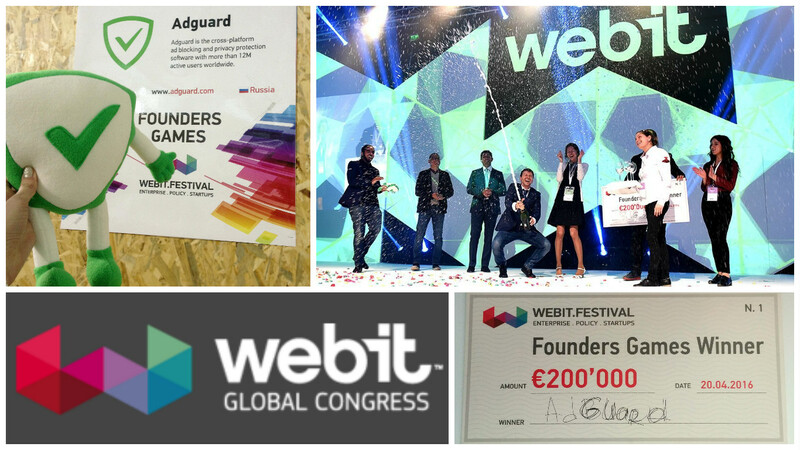 We won the competition and received the 'grand prix': €200,000 investment. April ended with a very important Adguard for Android release, basically starting with version 2.5 the app has https filtering, which means ad blocking on YouTube, Facebook Twitter – you name it. In May we have released [version 1.0.6](https://blog.adguard.com/en/adguard-for-ios-version-1-0-6/) of Adguard for iOS which introduced the feature of manual element blocking on a web page. We are always serious when it comes to privacy protection. And we have always strived to be as transparent as possible. So we decided to share our policy regarding open source and open the source code of our free products (browser extensions, Adguard for iOS). Why? Free apps usually raise questions about the ways of their monetization, whether or not developers transfer your data to third parties. It's definitely not our option, we earn by just selling licenses for our programs. And free versions go open source (we have nothing to hide anyway :)), and we believe that all the free products shall follow this rule. June began quite cheerfully with the introduction of a new [annoyances filter](https://blog.adguard.com/en/annoyances-filter/) to most of Adguard products. Then it was time to release version 2.6 of Adguard for Android with the DNS servers, improved compatibility with third-party apps, blackjack and many other updates. Then we introduced update for Mac, which made Adguard faster and less battery consuming. On the first day of July we [released a new product](https://blog.adguard.com/en/adguard-content-blocker/): Adguard content blocker. In fact it is a free version of Adguard for Android but only for Yandex and Samsung mobile browsers. What it does and what are its features is to be easily found in our blog. First of all we have published [version 2.7](https://blog.adguard.com/en/adguard-android-2-7/) of the Android app, which gathered a great deal of important changes such as new Firewall and additional capabilities for creation of own filtering rules. And the end of the month marked the update of extension and a new version of Adguard for Windows. The last one, by the way, added several useful features to Stealth mode feature (which is in charge of data privacy). Learn more here. Released in July, reworked in September. It's about the new version of the [content blocker](https://blog.adguard.com/en/adguard-content-blocker-v1-2/), which we have fully redesigned (new interface presents tile structure that grants easy acess to any feature). And other important news: release of the new product to the delight of apple's smartphone users. Adguard Pro for iOS is the app for iPhone and iPad, which can block ads even in apps. This is the main difference from the basic app Adguard for iOS. In October we have [issued an update](https://blog.adguard.com/en/adguard-for-ios-v1-1-0/) for the free iOS app for iPad/iPhone and introduced the [DNSCrypt support](https://blog.adguard.com/en/adguard-dns-now-supports-dnscrypt/) for our Adguard DNS. And again here is an update for Android users, [version 2.8](https://blog.adguard.com/en/adguard-android-2-8/)! It turned out to have a lot of changes (quite a serious preparation for the release of 3.0!). And finally in December we have [updated the browser extension](https://blog.adguard.com/en/adguard-browser-extension-2-5-8/) again. Version 2.5.8 basically corrects all the found errors, so the extension generally will work more stable. But why not please all Apple devices users? Here came two updates simultaneously, one for Adguard for iOS and another for Adguard Pro for iOS. Adguard Pro update gives users more options for fine-tuning the filtering and makes it more friendly towards blind users and users with a visual impairment. Besides that, both versions have become much more stable. By the way to celebrate the holiday season we are currently holding a promotion (there are discounts and a chance to win a tablet), check it out. We have started a new section ["The more you know"](https://blog.adguard.com/en/tag/the-more-you-know/), where we are going to publish articles on advanced Adguard features that you may not have known before. You might have decided that we were done for the year, especially if you'd read the '2016 recap' article - but we have one more present left, this time for our Windows users - a new Adguard for Windows version.